We’d love your help. Let us know what’s wrong with this preview of The Beast of Rose Valley by J.P. Barnett. Something evil stalks the citizens of Rose Valley—not for the first time, but hopefully for the last. After suffering through a horrific car accident, Jake Rollins struggles to survive in his tiny hometown of Rose Valley—a place to which he hoped never to return. When a sheep is viciously mutilated on the ranch where Jake is recovering, he's dragged back into the cloying politics of small town life. While the Sheriff tries to pass off the incident as the work of coyotes, Jake turns to a local reporter and old high school flame, Shandi Mason, to search for the truth. They discover that this creature has stalked Rose Valley before, claiming nearly a century of carnage and intrigue, all starting with a shameful secret guarded over by one of the town's most respected citizens. 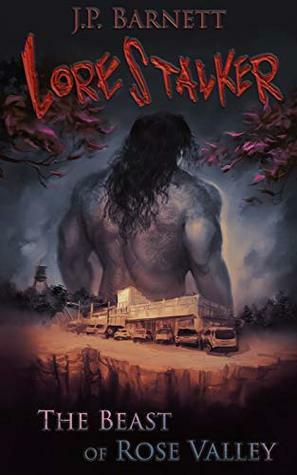 As livestock mutilations escalate into deadly attacks on humans, and the Sheriff organizes a foolhardy manhunt, Jake and Shandi must race to save the town from a seemingly unstoppable evil. To ask other readers questions about The Beast of Rose Valley, please sign up. I don't usually read books like this but I have to admit, I was really impressed with this book. It was fast paced and really grabbed my attention. I did have a few issues but not many. I felt like there were to many characters, while I get they all have important parts, there were just times where there were so many that I didn't know who was who. Also, when the action happened, I feel like it was rushed and kinda jumpy. I got the idea of what was going on but there were times I was wondering wh I don't usually read books like this but I have to admit, I was really impressed with this book. I did have a few issues but not many. I felt like there were to many characters, while I get they all have important parts, there were just times where there were so many that I didn't know who was who. Also, when the action happened, I feel like it was rushed and kinda jumpy. I got the idea of what was going on but there were times I was wondering what happened from point A to point B. But it was still good! Don't get me wrong. I've never read a book like this before. I honestly thought this dude was a werewolf or something but nope. Lol And the person I thought it was, I was wrong... Kinda. Lol It def keeps you questioning. I really loved the ending though. It was the perfect kind of ending for me and all my answers got answered. For readers and fans of monster legends and folklore, prepare yourselves for a new writer and his series to captivate your attention. New author J.P. Barnett has just recently published the first in his new Lorestalker Series that promises to give stories to readers fascinated by the legendary folktales of old. The Beast of Rose Valley is the first of Barnett’s series as well as his debut novel and offers a fast-paced suspenseful tale about a monster terrorizing a small town and what the small t For readers and fans of monster legends and folklore, prepare yourselves for a new writer and his series to captivate your attention. New author J.P. Barnett has just recently published the first in his new Lorestalker Series that promises to give stories to readers fascinated by the legendary folktales of old. The Beast of Rose Valley is the first of Barnett’s series as well as his debut novel and offers a fast-paced suspenseful tale about a monster terrorizing a small town and what the small town must do to save themselves. Rose Valley, Texas is a small town where everyone knows everyone and consists of a community where everyone is born, raised, and lives their full lives there. A few community members dared to venture out into the world, only to find themselves back where their lives began. Jake Rollins barely managed to survive a terrible car accident and is under the care of a well-schooled doctor and colleague in Rose Valley. On top of caring for his health, he has been present to the aftermath of some strange incidents that have been occurring around town. It may not seem like a large concern, considering the deaths that have occurred are namely livestock, but when said livestock’s remains are found turned inside out, of course concern is going to spread. The respected sheriff of Rose Valley tries to keep the multiple mutilations under wraps, but Jake knows something is going on and only with the help of a local reporter and familiar colleague, Shandi Mason, can he uncover what is terrorizing their small town. Little do they know that their terror is an unimaginable nightmare that leaves them with a near impossible decision to make: to kill the terror and save the town… or to save the terror itself. It seems to be rare to find an intriguing monster story nowadays. Barnett has changed that and has offered the first in a series of stories that will give readers an enjoyable read about monsters and, in the future, perhaps some well-known folklore, as well. To start, allow readers to focus on Barnett’s writing style. Short, sweet, and to the point, Barnett tackles has the ability to tackle a story quickly. He gives just the right amount of detail to hint at the monster, but does not prolong the inevitable introduction of it to the readers. He picks and chooses what he describes which equals an excellent amount of detail for the readers: not too much and not too little. Barnett’s strength, however, lies within his dialog and character development. Both go hand in hand as, through his dialog, Barnett develops his characters and makes them stronger. Now we come to the next aspect of Barnett’s writing skills: storytelling. The Beast of Rose Valley is a cleverly concocted folktale of an unheard of monster. The story itself can be a bit predictable at times; however, it offers an enticing and intriguing new story. While Barnett meant for his series to be more a part of the horror/ thriller/ suspense genre, the first in his series proves to be more thriller/ suspense. He offers just the right amount of delaying the story’s monster secret to give the readers suspense, but does not keep them hanging for too terribly long. This actually offers a nice reprieve to readers who silently yell at the author to “reveal what the threat is already!” to “I want to know what the… Oh, okay, fascinating! I want to know even more!”. What is personally nice about this particular monster is that it almost comes across as a Frankenstein’s monster sort of figure which, with the characteristics of a classic well-known monster, will most certainly captivate the attention of a broader audience. Let us focus next on the characters that have been created for this series. Barnett is an author who focuses on minimal characters which proves to be more beneficial to stories, especially series, for it allows readers to become closer to certain characters. For The Beast of Rose Valley, readers may find themselves becoming closer to Jake and Shandi. Jake is a very relatable character: a man, with a fascination for monster tales and folklore, who grew up in a small town and wished to get away. Getting away caused a series of traumatic events that landed him back in said small town. Now, he wishes to strengthen himself after a horrific accident and, perhaps, make his life better with the addition of a new person who he has considered perhaps more-than-a-friend since he was in high school. Shandi, who shares mutual feelings with aforementioned said character, is a nosey reporter who proves to be an excellent investigator and one who doesn’t take crap from anyone. This almost instantly makes her a likeable character and an excellent addition to the ever-growing powerhouse female character roster of today’s fiction. For the duration of this story, readers will be rooting for these two to get together upon the story’s conclusion. While The Beast of Rose Valley proved to be an excellent introduction to a highly anticipated new monster series, there are a few small details that could use a bit of development. The story itself is a bit predictable, yet still enjoyable. Rather than the horror/ suspense/ thriller genre it was geared towards, it was more suspense/ thriller. There weren’t too many scenes that proved to be horrifying and intense in nature, but the story itself still proved to be an excellent new “creature feature”. While the story was fast-paced, there were times when the storytelling could have slowed down. Readers may wish to know more about the monster and its backstory. Along the lines of some of the character’s backstories, some details as a whole are a bit vague, such as Jake’s car accident and other details readers will come across while reading. Perhaps, in future books, Barnett can expand on and offer more details on crucial events that involve characters and/or the story as a whole. New author Barnett has captivated readers with the first in his new suspense/ thriller Lorestalker Series. With fast-paced storytelling and characters developed excellently through dialog, The Beast of Rose Valley is Barnett’s debut in the writing community and it proves to be a gripping new story that will captivate the attention of those who love monster legends and tall tales of folklore. This story proves to be a cleverly concocted lore and the beginning of a series with incredible potential. What other monsters of lore will be introduced to readers? Where will the monsters sprout up? Will any of these, like the one in The Beast of Rose Valley, be brand new original creations? Within a series of unknown length, readers are in for a real treat as Barnett’s Lorestalker Series continues with the second book The Kraken of Cape Madre, releasing in November of this year! I was not sure if I would be able to read The Beast of Rose Valley. I hardly can read horror stories with the "monster" character lurking in the shadow. J.P. Barnett surpassed my expectations. You get the thriller and chills. I was holding on to the my kindle as I swiped through each page. The characters were well developed too. There were a few moments I would lose who did what, but the author does an amazing job getting you back on track. So many suspenseful moments that were hard to figure ou I was not sure if I would be able to read The Beast of Rose Valley. I hardly can read horror stories with the "monster" character lurking in the shadow. J.P. Barnett surpassed my expectations. You get the thriller and chills. I was holding on to the my kindle as I swiped through each page. The characters were well developed too. There were a few moments I would lose who did what, but the author does an amazing job getting you back on track. So many suspenseful moments that were hard to figure out until the end. That is what I always love about thrillers. They have to keep me on my toes. I cannot stand it when I figure what happens next before it is unveiled. Not here. Not with this book. The Beast of Rose Valley is a great weekend read with a nice cuddly blanket and a glass of wine! The beast of rose valley is a horror thriller story about something killing Steve’s Lambs in Rose Valley. His livestock is being killed in a very suspicious way and no matter how hard he and his friend Jake try to enforce more investigation towards the matter, the officials do not follow up on it. Then Shandi, the journalist shows up and changes the dynamic of the situation in a very interesting way. As a horror story, I believe the story was spot on. It was just as thrilling to figure out who wa The beast of rose valley is a horror thriller story about something killing Steve’s Lambs in Rose Valley. His livestock is being killed in a very suspicious way and no matter how hard he and his friend Jake try to enforce more investigation towards the matter, the officials do not follow up on it. Then Shandi, the journalist shows up and changes the dynamic of the situation in a very interesting way. As a horror story, I believe the story was spot on. It was just as thrilling to figure out who was at play and how the situation was going to end. The storyline had twists that kept changing the dynamic for me, and that made the book thought-provoking. The pace of the story was suitable for the genre. I believe anyone who enjoys thrillers would find this one intriguing to read. The concept was novel and the characters were well put together. The small town certainly has been holding on to a lot of secrets. I particularly enjoyed Jakes character. His personality was a delight to read and as I read more, I looked forward to seeing how the mystery was going to reveal itself. I also look forward to reading more from this author. This was a really fantastic book. I was really engrossed not only with the story, but with the characters themselves. The book is about 276 pages, but I couldn’t put it down and read the whole thing over about 10 hours. The plot was AMAZING and kept me guessing. Being from Texas, I really empathized with the characters and the setting. I’m really looking forward to reading more books by this author. Mr. Barnett takes us on a journey to small town Texas and brings into the culture and intrigue of living where a Cryptid is discovered. His actions scenes are as fast as a Clive Cussler story, and he uses Michael Crichton like ethical questioning to compel you to move from page to page as you look to understand the mystery behind what is happening in Rose Valley. Great new author. I look forward to reading more from him. It’s a strange thing to read a book and recognize its DNA, from people and places in your life. A great first book, by a new author. I’m looking forward to reading more from him and seeing his talent grow. If you enjoy eerie creature features, this one needs to go on your list. J.P. Barnett offers a slice of small town Texas life within a captivating horror/mystery and adds a great twist ending on for good measure. I hope this is the first of many good reads to come for this debut author. Can't wait for Lorestalker Book #2. A quick, fun read to escape from my day. I really enjoyed this one. Fast-paced and engaging. Not my usual genre, but this book kept me hooked until the end. Loved the rich details of the tiny Texas town and the characters that inhabit it. Good read. First of all, this is not as horrific as one would expect from a “horror” book, thank goodness. This certainly kept me entertained; I had a hard time putting it down. It’s intelligent, fast-paced, and creative. Given that this is the beginning of this author’s career, I’m sure we will see a lot of growth as time goes by. There were a few really great one-liners! It’s important to me that authors have a sense of humor, regardless of the genre. Sometimes I need that little break from the drama. The p First of all, this is not as horrific as one would expect from a “horror” book, thank goodness. This certainly kept me entertained; I had a hard time putting it down. It’s intelligent, fast-paced, and creative. J.P. Barnett grew up in a tiny Texas town where the list of possible vocations failed to include published author. As a child, J.P. consumed any book he could get his hands on. The likes of Stephen King, Michael Crichton, and Dean Koontz paved the bookshelves of his childhood, providing a plethora of fantastical and terrifying tales that he read way too early in life. Though the effect these books J.P. Barnett grew up in a tiny Texas town where the list of possible vocations failed to include published author. As a child, J.P. consumed any book he could get his hands on. The likes of Stephen King, Michael Crichton, and Dean Koontz paved the bookshelves of his childhood, providing a plethora of fantastical and terrifying tales that he read way too early in life. Though the effect these books had on his psyche could be called into question, these masters of storytelling managed to warp his mind in just the perfect way to spin a fun yarn or two.